One of the biggest pre-trip questions is always, what should I pack?! I love packing, and am always striving to pack lightly. There are lots of reasons to pack lightly. My constant attempt to pack minimally is partially derived from the fact that I seem to only have weekender and “pack all worldly possessions for giant move” size suitcases, so unless I buy more luggage, those are my options. In another post we talked about avoiding extra fees for checked baggage, but there’s also the added value of not having said baggage lost if you experience delays, miss a connection, or decide to bump to an earlier flight. Also, I find traveling with less just makes things easier. Throwing a small backpack on your back or wheeling a tiny light rolling suitcase is a lot easier when you’re budget traveling and running from subway stations to train station to busses, and the endless number of unplanned staircases that accompanying that type of travel. It’s also simply less of a hassle when you’re not constantly trying to keep track of your stuff because there’s less of it to lose. That being said, I am a girl who likes to have options, so I am no “pack the same black outfit and wear variations of it everyday” type traveller. I don’t like having to wear the same thing over and over while I’m traveling and believe that half the fun of being off the clock and on the road is the ability to wake up in the morning and decide what you fancy for the day- wardrobe included. Last weekend I took an extended four-day trip to Philadelphia to visit one of my best friends from college who was having her white coat ceremony in dental school, and to run the 10mile Broad Street run. My wardrobe needs went from white coat ceremony and fancy dinner with her family afterwards, to night on the town, to race gear. The temperature also was going to fluctuate from 50’s in Boston when I left at 5am, and anywhere between 65 and 85 in Philly over the couple days I was going to be there. I also have those pesky finals still coming up and needed to study, so my heavy laptop and my notebook had to come with me (I strongly dislike traveling with my laptop but find myself bringing it more often than not). 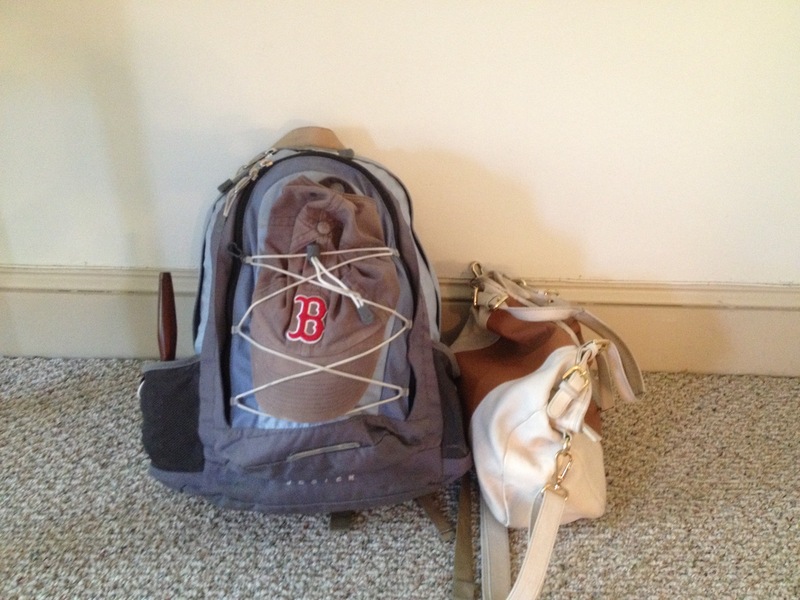 I refused to take with me more than a backpack and my purse. It was a long weekend after all! 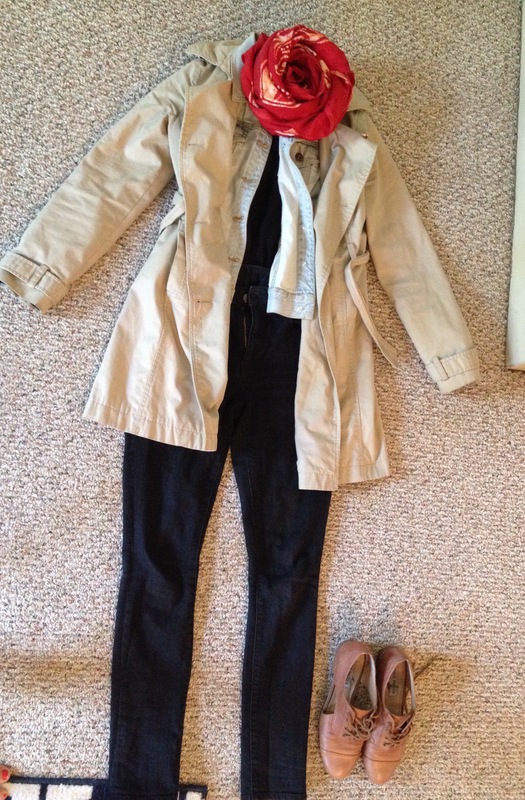 Worn: khaki trench, jean jacket, red scarf, black high-waisted jeans, black sleeveless top, brown leather brogues. I had two outfit combinations that I didn’t even get to use while I was there, and was very appropriately dressed for all the occasions I encountered. I could have probably brought less, but I was happy that I was able to pick and choose my outfits as I pleased. If I were to shave down my packing even further, I’d probably get rid of one of the day dresses, switch the yoga pants to more compact shorts, and cut down my makeup items. Because I was staying with my friend I could get away with not bringing toothpaste, shampoo, conditioner, curling iron, towel, etc. If I were staying at a hostel fitting it all into my little north face book bag would have been more of a challenge, but I am convinced still doable. I left down a razor which snapped in the bottom of my bag, and up a race shirt and medal. On the way home I got a bit lazy and didn’t roll all my clothing, so it was a bit tighter. It was also 88 degrees in Philly, so my trench, Jean jacket and scarf that I made the inbound journey with got stashed in my backpack for the way home. My next challenge is going to be a week in London at the end of the month. Last time I opted for the international move size luggage option when gifts for my hosts became a little unwieldy; this time I’m going to try to make it work with my little carry on size rolling suitcase. The big suitcase was a nightmare last time I was there, as I lugged it from house to house and on the many flights of stairs across London. I survived a week in winter between Paris and Rome with just my North Face backpack once, so I am determined to make my little suitcase work this time around! What are your short trip travel packing tips? 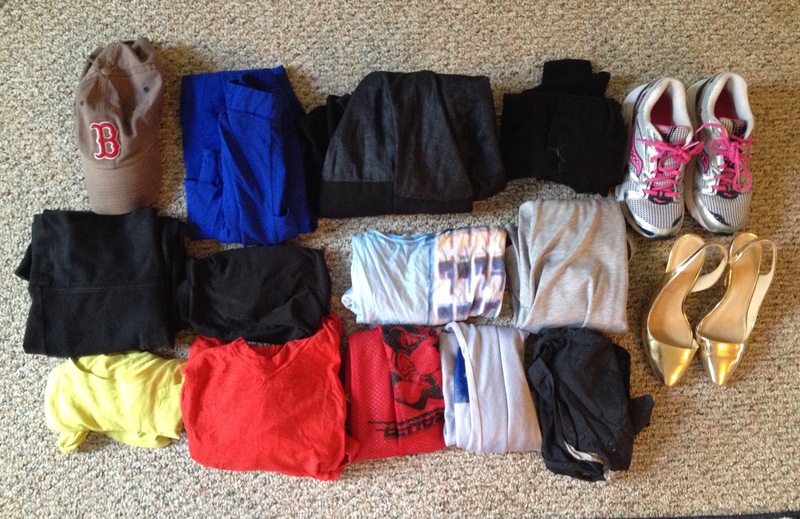 How do you strike the balance between packing light and having enough options?